The controversy of having four players denied the opportunity to play continued as Bermuda took to the court for their final game of the FIBA AmeriCup 2021 Caribbean Pre- Qualifiers in Paramaribo, Suriname. Bermuda was once again forced to play short, this time just five players dressed with Chris Crumpler not able to play due to injury and they took on Monserrat a team they previously defeated. 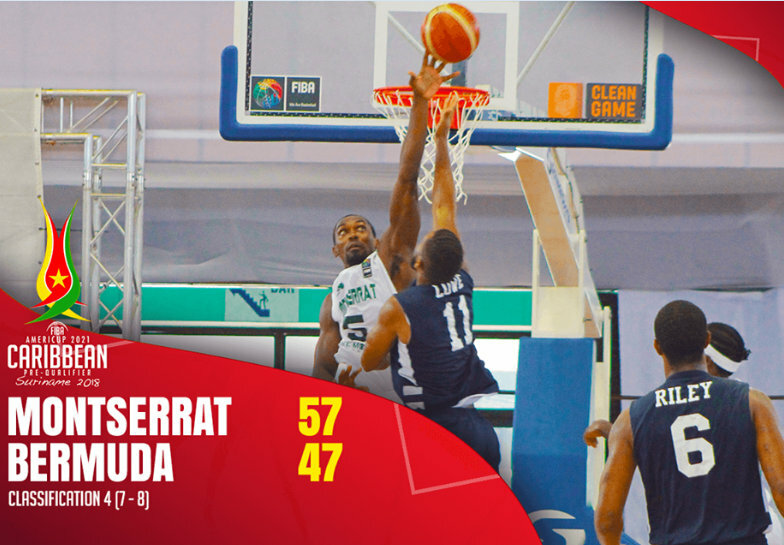 However Bermuda on spent legs could not repeat the feat, but they gained many fans with their effort throughout the tournament falling 57 – 47. Bermuda led 14 – 13 after the first quarter and then outscored Montserrat 9 – 7 in the second quarter to take a 23 – 20 lead to the break. Monserrat would outscore Bermuda 18 – 15 in the third quarter, sending the game into the final quarter level at 38 – 38, but the Bermuda legs would not be able to maintain the pace as they would be outscored 19 – 9 in the final quarter. Te’Jour Riley was the top scorer for Bermuda with 16 points, Jason Lowe added 12 point, Adam Correia scored 9, with Seward Smith scoring 7 times and Vernon Lambe III scored 3 points.